VANCOUVER, Jan. 27, 2016 /CNW/ - While Canadian pre-retirees over the age of 45 are some of the most likely in the world to want to retire in the next five years (74%), just under half (45%) of them don't expect they'll be able to do so – faring just slightly better than their peers in France (54%), Argentina (51%), and Singapore (48%). Furthermore, a staggering 93% – the highest proportion across all 17 markets surveyed – say that financial considerations such as a lack of savings, too much debt, or the need to support dependents are thwarting their retirement dreams. Betty Miao, Executive Vice President and Head of Retail Banking and Wealth Management, HSBC Bank Canada said: "Retirement should be the opportunity to choose exactly what you want to do – travel, try a new adventure, spend more time with family and friends or just enjoy your freedom. Yet our latest global study, Healthy new beginnings - the twelfth in the Future of Retirement series – shows that for many working age people in Canada and around the globe, putting money aside for a comfortable and healthy retirement is not always easy." "Serenity Now! ": Consistent with the global average, 25% of pre-retirees aged 45+ in Canada that would like to retire say it is because work is having a negative impact on their mental and/or physical health. However, 28% of retirees in Canada say their overall health got worse in retirement – although they are better off than their counterparts in the USA (36%), UK (37%) and France (36%). The age of un-retirement: The latest report says that 14% of pre-retirees in Canada don't ever expect to retire – consistent with last year's finding of 15%. In fact, those in other countries surveyed are coming around to Canada's way of thinking: the global average nearly doubled to 18%, up from 10% last year. The next big health and lifestyle guru: your nana? With more time to spend on healthy living, Canadian retirees are some of the most likely to rate their health as good for their age. In fact, three quarters (74%) say they eat a healthy diet and the majority (55%) rate their health as 'good for their age', compared to the global averages of 70% and 45% respectively. The unforeseen cost of medical care. Health-related costs can be considerable in retirement, however three quarters (75%) of working age people in Canada do not know how much they will spend on healthcare when they retire. 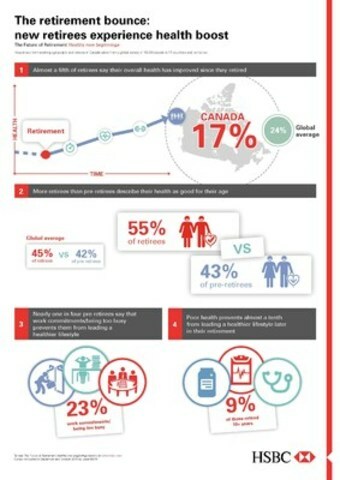 This is noteworthy considering that Canadians are some of the most likely to say prescriptions and medicines are a financial outgoing in retirement (68% vs. global average of 45%). In fact, they are the largest financial outgoing for 9% of Canadians aged 65+. Added Miao: "With today's uncertain economic climate and the suggestion of tougher times ahead, Canadians entering retirement age should take comfort in knowing that health concerns were significantly less of a savings-hurdle for today's retirees than they expected. In fact, it's all the more reason to start planning now for the active life you want to live in the future." The Future of Retirement is a world-leading independent research study into global retirement trends, commissioned by HSBC. It provides authoritative insights into the key issues associated with ageing populations and increasing life expectancy around the world. This report, Healthy new beginnings, is the twelfth in the series and represents the views of more than 18,000 people in 17 countries and territories worldwide (Argentina, Australia, Brazil, Canada, China, Egypt, France, Hong Kong, India, Indonesia, Malaysia, Mexico, Singapore, Taiwan, United Arab Emirates, United Kingdom, United States). The findings are based on a nationally representative survey of people of working age (25+) and in retirement, in each country or territory. The research was conducted online by Ipsos MORI September and October 2015, with additional face-to-face interviews in Egypt and the UAE. Since The Future of Retirement programme began in 2005, more than 159,000 people worldwide have been surveyed. HSBC Bank Canada, a subsidiary of HSBC Holdings plc, is the leading international bank in the country. We help companies and individuals across Canada to do business and manage their finances internationally through three global business lines: Commercial Banking, Global Banking and Markets, and Retail Banking and Wealth Management. Canada is a priority market for the HSBC Group – one of the world's largest banking and financial services groups with assets of US$2,549bn at 30 September 2015. Linked by advanced technology, HSBC serves customers worldwide through an international network of around 6,100 offices in 72 countries and territories in Europe, Asia, North and Latin America, and the Middle East and North Africa.